List of Restaurants in Capri where you will love to eat. Emperor Augustus called it “Apragopolis”, the city of do-nothings, and said the people in Capri spent their days eating or carousing, which in truth is what most people still do there every day, which is why the restaurants you choose are critical. Capri has the reputation today as the ‘isle of love’, and many famous Hollywood lovers from the 1950’s and 60’s including Audrey Hepburn and Carey Grant, and Liz Taylor and Richard Burton contributed to that tag. Today it is still frequented by the world’s wealthiest and most famous people, and they all come to eat, love, and carouse! This island is every bit as enchanting as you hope it will be, the important thing is to go on long walks to see it all; the sea, the beaches, the boutiques, and the breath taking surrounding natural environment. By day, Capri is a bustling mecca, as an additional 6000 or so tourists flock here each and every day from the neighbouring mainland for a quick look. By night, the locals seem to breath a collective sigh of relief as the so-called residential crowd of tourists physically staying there step out to indulge in the beauty and culinary delights Capri has on offer. Hotel Qvisisana is the best location for people watching before dinner. Keep your eyes peeled, as you are highly likely to see someone famous indulging on the next table in your restaurant, and dress well. This island is glamorous. Before Dinner: Aparativo is big in Italy, and what better place to enjoy it than Capri. The Luxury five star Hotel Qvisisana is located right in the heart of Capri and has a gorgeous area for drinks at the front, where you can sit and indulge in a gorgeous cocktail, even if you are not staying there, and watch the passing parade before wandering off to your dinner reservation. Its definitely a Capri essential. Villa Verde, Capri: James Packer frequents Villa Verde in Capri. He is often seen there with Mariah, and in August was there with her. No wonder – this place is the real deal. Other famous people who have eaten here include Charlize Theron, Pierce Brosnan, Nicolas Cage, Samuel Jackson, Robert de Niro, Eva Longoria, Magic Johnson, queen Latina, daughter of princess Charlotte, Cristiano Ronaldo, and on it goes. Villa Verde is frequented by the crowds off the boats. 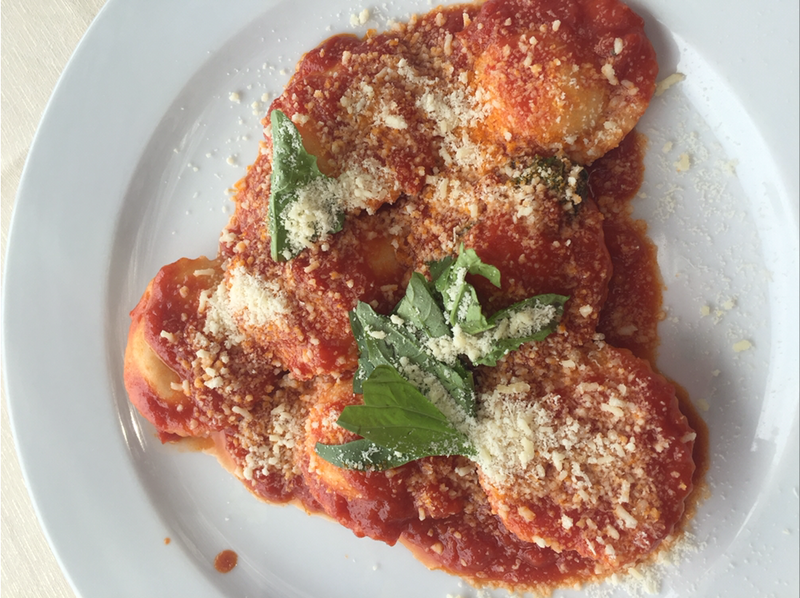 Villa Verde is a simple, family owned and run restaurant & and the food is sensational. There are vegetable gardens around it where the tomatoes, mint, rosemary & other vegetables are harvested. It’s not expensive, glamorous or over the top. My fabulous fresh fish dish at Villa Verde – fish of the day with ho made capsicum, olive and caper sauce. 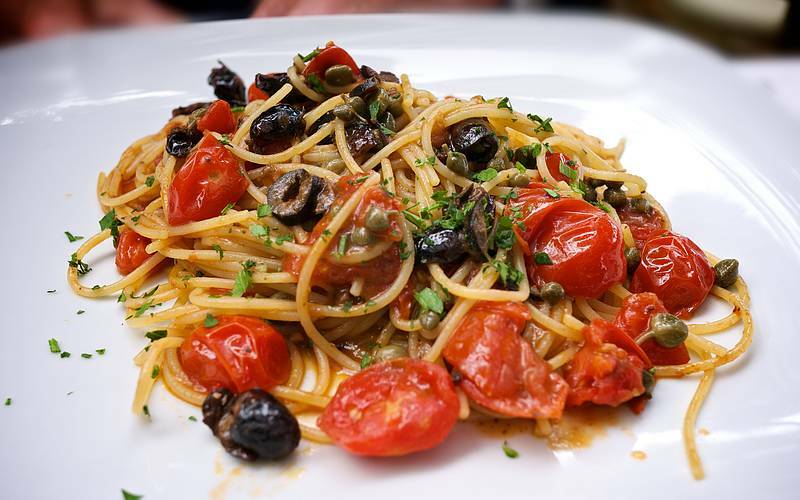 My favourite dishes include truffle pasta, incredible lobster pasta with home made sauce, tuna tartare, fresh grilled fish, Caprese salad with blazing red tomatoes and mozarella that melts in the mouth. There are gorgeous pizzas, fried and stuffed zucchini flowers are a specialty, and there is an array of salads on offer. With 20 chefs in the kitchen, there’s not much that’s not available, and the menu is incredibly diverse. After so many carbs all over Italy, the sushimi and seafood was a relief, and such amazing quality. The dining room is expansive, and seats 250, but doesn’t fill up until after 9pm. The Italians and holiday makers in these parts like to eat late. It is the restaurant of choice for a lot of the glamorous set with boats in the harbour, so there are a lot of tables with 10 or more people, creating a buzz. After 21 years, grandma – the mother of the owner, who is 84 in October – is still in the kitchen each day. The Europeans respect older women & respect their elders. The people? Glamorous, but be warned, most smoke at the tables, as the roof whilst covered, is essentially open. The restaurant seats 250 – and is packed every night of the week in summer. Lunch there is gorgeous, but the cool crowd go for dinner & move downstairs to the bar – that’s where I spotted James & Mariah who’d apparently stepped of their not one, but two boats moored in the bay for the night. And they were beyond happy, as was I – especially with the bill. Don’t miss this when you go to Capri. Located on a street off the main square of the town, this upmarket spot sits between a sea of boutiques in a narrow little walking lane. It is one of the toughest restaurants in Capri to get into, so make sure you book ahead – and dress up. Giorgio Armani was there the night I went and Elle Macpherson has ben as well as the regular celebrity Capri crowd. The feel is like someone’s home which has been packed with as many tables and chairs as possible to fit hundreds of people in. It is intimate but packed. Fun art and warm colours. The pasta really is incredible. 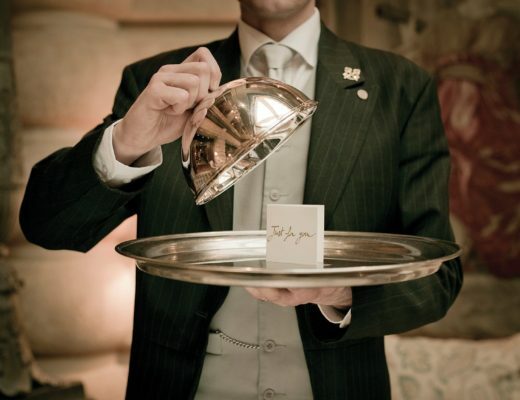 The waiters look after specific sections of the restaurant and are a touch pushy – the main reason being you are on limited time and they want to satisfy your every whim, and say goodbye. Seafood is a highlight. I liked the grilled calamari, as well as the grilled fish and the veal chop with spinach and potato. The food is clean, healthy and perfectly cooked. Creative desserts too. The wine cellar is truly awesome, and is lit by candle each night. You can’t miss it when you visit the bathrooms, and it is well worth a look. It is an expansive restaurant, but the best place to sit is outside on the street front, where you can watch the passing parade. 3. Ristorante Panorama: Perched on a steep incline, this casual Italian spot has beautiful views over the water, and its own vegetable garden. Just follow the signs on the walls to find it. Ristorante Panorama is one of the best locations for lunch. My favourite lunch spot in Capri Town, this is the perfect place to have a life changing pasta dish, such as ricotta filled pillow pasta and tomato sauce, as the pasta is fine, hand made and to die for, and a fresh rocket and parmesan salad. I ate here three times, and each meal was the best, and everything was amazing, as the produce is super, super fresh. The staff are typically Italian, in that they are male, older and full of fabulously entertaining stories, having worked there for many years. Glasses of gorgeous local Italian wine are reasonable at 7 Euro. 4. 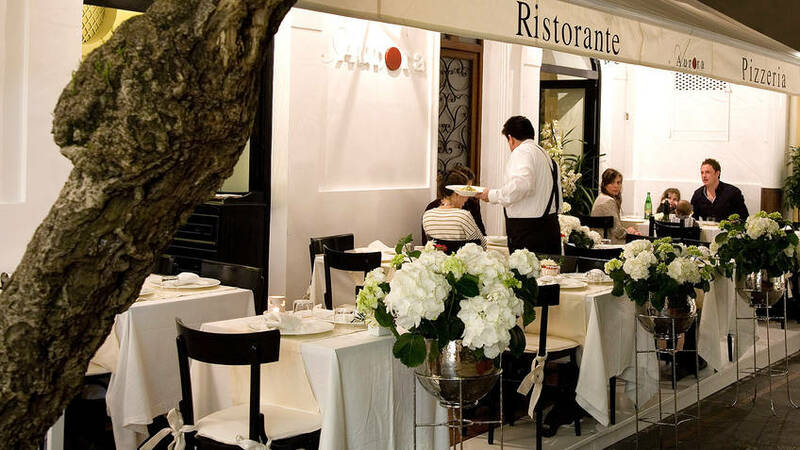 Da Luigi – For many, this restaurant is the highlight of their trip to Capri, and many return guests label it as they favourite restaurant in Capri, as the location is literally one of the best in the world. You reach it via shuttle boat (provided by the restaurant) from the Marina Piccola beach area. 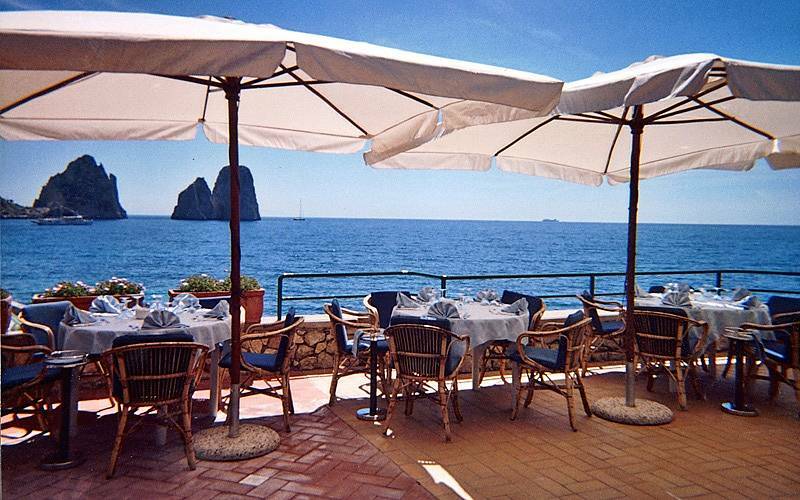 You dine sitting beneath the island’s famous Faraglioni Rocks, which is just spectacular. Every bit of the vista is an instagram moment, it is just jaw droppingly beautiful. The menu is littered with seafood choices, and there are fresh fish of the day pulled from the clear waters surrounding your table. The idea is to take your swimmers and beach gear, and have a swim in the private beach area before or after lunch and truly savour the location, as it is so special. Incredible lemon and shrimp pasta, which tasted tarte and slightly creamy with the fresh shrimps cutting through the flavours. Magnificent. If I could decide where I would eat my last lunch in life, this place would be it. For me, this is the best restaurant in Capri, but not because it is over the top, quite the opposite. It overlooks the incredible Capri coast, has fabulous meditteranean food and wine, great service, and is completely chilled out. It is the perfect place for a five hour lunch. The beach area of Marina Piccola is a 15 minute walk from the town ( and a very tough 30 minute walk back up as it is so steep), but there is a bus. 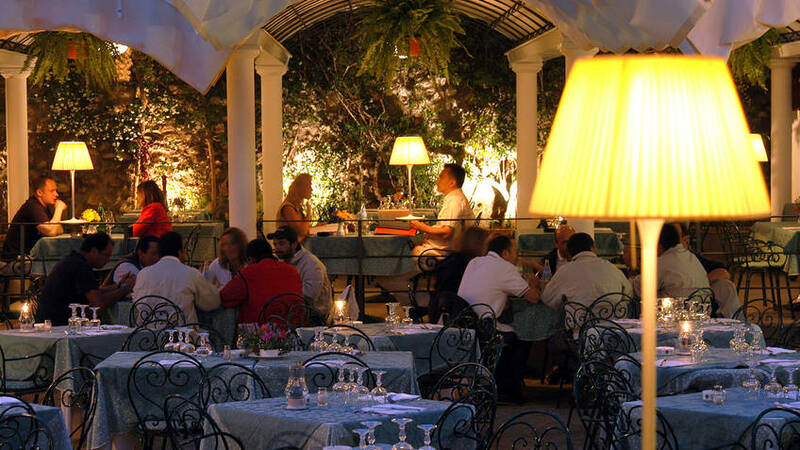 This is another area where you will find some of the best restaurants in Capri. I like the walk, I like the fact don’t have to get on a boat to get there, I love the views, and the lemon pasta, and home made ravioli and fish fillet was absolutely flawless. Beautiful wines by the bottle, and plenty of time and space to reflect on the meaning of it all. Life is so busy for everyone in the tines we are living in. Here is the one place I found to get away from all that. on your site ? I can write hi quality articles for you.